Independents Day is held in the UK on 4th July to celebrate independent businesses. The aim of the day is to draw attention to independent businesses and help raise awareness and footfall. How can you get involved as a Bristol Independent business? Display a Bristol Independents poster in your window, on your premises or website, a copy is downloadable here or can be supplied by post. Run a special event, provide a special offer on the day or provide something different to normal. You could extend this over the weekend if you wish. Send your offer by email to bristolindependents@gmail.com so that it can be uploaded on to the website, and include any special instructions which customers will need in order to claim their offer e.g. 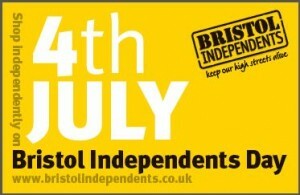 “show your Bristol Independents Day card at the till”. Write about your special event, offer and post pictures on Facebook/Twitter (see Bristol Independents on Facebook and @BristolIndies or #BristolIndies hashtag on Twitter). Bristol City Council, Outset Bristol, City of Bristol College, the Federation of Small Businesses and Destination Bristol will be using the day to promote the range of support available to start-up and existing businesses. 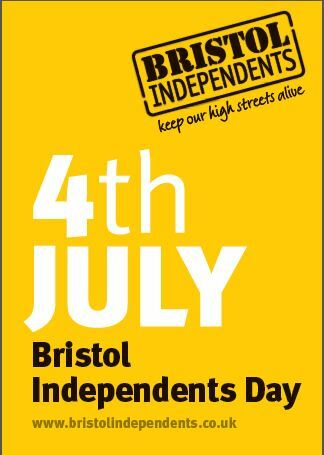 This factsheet has been put together by Bristol City Council to promote business support relevant to high street and local centre businesses across Bristol, as part of Bristol Independents Day on 4th July. If you wish to download this factsheet as a .pdf you can download it here. Want to improve your digital connectivity and make your business more competitive? Small businesses can apply for £200- £3,000 to improve their broadband connectivity. No match funding is required. See www.connectionvouchers.co.uk/bristol and www.connectingbristol.com. The West of England Growth Fund operated by the Local Enterprise Partnership is likely to reopen for applications shortly. See www.westofenglandlep.co.uk. Business West provides access to a number of funding opportunities – Virgin StartUp – advice, mentoring and loans of between £1,000 and £25,000 to budding entrepreneurs; Growth Accelerator – up to £2,000 per senior manager (match funded) towards leadership and management training, plus coaching and workshops; UK Trade & Investment and Enterprise Europe Network – subsidised international trade services and support; Finance Navigator – bespoke finance support service. See www.businesswest.co.uk. There is business rate relief available for most businesses occupying premises with a rateable value of £12,000 or under, a £1,000 retail relief for businesses occupying a space with a rateable value of up to £50,000 and a re-occupation relief (equivalent to a 50% discount) where retail premises are re-occupied after being empty for at least one year. All reliefs are subject to eligibility criteria. See www.bristol.gov.uk/rates. Heard about Bristol as European Green Capital 2015? Over 500 businesses and organisations have pledged to support the work of the Green Capital Partnership and receive benefits from extensive networking to entry into schemes like the West of England Carbon Challenge, which cuts business costs and improves efficiency. See www.bristolgreencapital.org. For businesses interested in the 2015 programme, see www.bristol2015.co.uk for details of the 2015 Company’s progress to date. The Bristol Pound local currency scheme aims to encourage local trading. Support includes free marketing for businesses via the internet, blogs and tweets (over 8,000 Twitter followers), regular business to business events with opportunities to meet with 650+ businesses who are members of the scheme. See www.bristolpound.org. The Bristol Business Guide, which includes a listing of Bristol businesses, is in the process of being updated. Further information on how to be included for FREE will shortly be posted at www.bristolbusinessguide.co.uk. Destination Bristol is the destination management partnership for Bristol and South Gloucestershire. It works with over 600 major businesses and strategic partners with the aim of increasing business competitiveness within the city centre, supporting employment and growth within the visitor economy, and raising the profile of the Bristol city region as a world-class place to visit. See www.visitbristol.co.uk. Outset Bristol has a range of support on offer including information sessions and FREE workshops to help you develop your ideas and learn to run your own business. They are also able to provide Start Up Loans for businesses in their first 12 months of trading. See www.outsetbristol.co.uk. BRAVE Enterprise provides low-cost advice and training to new and growing small businesses. They offer practical and informative business skills development workshops on topics such as bookkeeping, marketing, PR and sales techniques, designed to bring immediate benefits to your business. See www.brave.org.uk. Business West provides a number of services to help people start a business and for established businesses. The start-up support includes Ready for Business and Virgin StartUp. For ambitious existing SMEs looking to grow, there are a number of subsidised support programmes, including coaching, finance and funding advice, leadership and management, and support on international trade. Business West provides a range of training courses. See www.businesswest.co.uk. The City of Bristol College can offer access to funding for NVQ training, a free recruitment service, training and development courses for your staff. See www.cityofbristol.ac.uk/employers. Ways2Work provides free support to businesses seeking to employ additional staff, holding regular networking sessions and jobs fairs. See www.ways2work.org.uk. Looking for property to start or grow your business? Details of vacant commercial properties can be found on an online property database at www.bristolandbath.co.uk. It’s advisable to walk around the desired areas to have a look at what’s available and then make contact with the agent. The Federation of Small Businesses (FSB) represents over 1,700 small business owners, the self-employed and entrepreneurs in Bristol. The FSB is a lobbying organisation which works with the council, the Local Enterprise Partnership, MPs and other organisations to put over the issues that affect small businesses. The FSB also arranges a wide range of seminars, social events, networking meetings and business breakfasts. See www.fsb.org.uk/119. Business West works with 18,000 businesses across the South West. Accredited by the British Chambers of Commerce, Business West runs the chambers in Bristol, Bath, Gloucestershire and Wiltshire. They provide Initiative membership, which influences strategic decisions and provides representation on key issues, including finance, regulation, tax, transport skills and more. See www.businesswest.co.uk. Could your high street win a Great British High Street of the Year Award? This competition is open for applications from Town Team and local partnerships until 1st August. See www.thegreatbritishhighstreet.co.uk. In addition to the above, Bristol City Council provides a range of support to businesses – assistance with finding sites or premises; planning advice; business information; licensing, trading standards, markets and street trading; procurement and local supply chains; environmental efficiency; health and safety; food safety; resilience, public health and transport. There are many other initiatives run by local community, Town Teams, private businesses and traders’/business groups. Information is often shared and promoted via Twitter – @ShopLocalBris. To receive regular updates or make an enquiry, please email business@bristol.gov.uk with Bristol Independents in the subject box. This entry was posted in Events and offers, Try something local today by Kristin Sponsler. Bookmark the permalink.